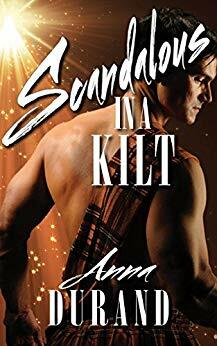 My favorite is Emery from Scandalous in a Kilt. I had already introduced the man who would become her love interest in previous books, since Rory is the brother of Lachlan and Aidan from books one and two. With Rory’s character set, I needed a strong woman for him, someone who would challenge him to overcome his fears and also intrigue him from the moment they meet. I love Emery’s fearlessness and honesty, even in the face of her new husband’s deep-seated anxiety about love. Another thing I love is the contradictions that make her a fascinating and lovable character. Emery is a computer programmer and a proud geek who loves superhero movies. Yet she’s also a free spirit who has no qualms about showing off her body. A lot of the humor in the book stems from her wild side colliding with Rory’s uptight side. Though he keeps trying to push her away, she just won’t give up on him no matter what. Emery’s loyalty is unwavering. One of things fans have told me they love about Emery is the way she knows what she needs and wants in life. I agree that’s another awesome trait and one of the many reasons Emery is my favorite heroine so far. Before she agrees to a marriage of convenience with Rory, she’s already secure in her vision of herself. Whether she can get what she needs from Rory, she doesn’t know. But she’s not the kind of woman who waits for a man to complete her. Emery goes after what she wants and makes her own happiness along the way. She forges friendships with everyone from Rory’s little sister to the taciturn gardener. And oh yes, she does everything she can to tempt her husband away from all his strict rules. Rory’s got himself a handful! But maybe that’s just what he needs.